I originally published this on the LA Times. The history of California is fraught with unsaid tragedies. The raven, glamorous mythology of Old Hollywood is enticing, but it overshadows the consequences and perils of such a fame-oriented society. In Montrose, deep in the La Crescenta Valley, there is a place where Hollywood’s “mad” women used to go. Rockhaven Sanitarium was founded in 1926. This was a period of Los Angeles madness at its peak: stardom, celebrity, wealth, extravagance, Hollywood, glamour, all right before the Depression catapulted this flamboyant way of life into beloved memory. But Hollywood had the very tangible power and disease to unhinge women. “Hysteria” is a phrase that has evolved over time, but it originated in Victorian England as a means of describing– as well as invalidating, punishing, and repressing– women who could think and feel without apology. Hollywood stirred up its own kind of “hysteria,” and many starlets suffered from mental disorders, particularly anxiety and depression. Women went to Rockhaven to recover and rest, not to be shackled, abused or committed involuntarily. Rockhaven Sanitarium is still indeed, a quiet haven in the California landscape: dry, dusty fountains and pathways littered with tangles of dehydrated weeds, wildflowers pale and lovely, swaying tenuously in the afternoon breeze, tired trees beautiful in their age and faded hues. 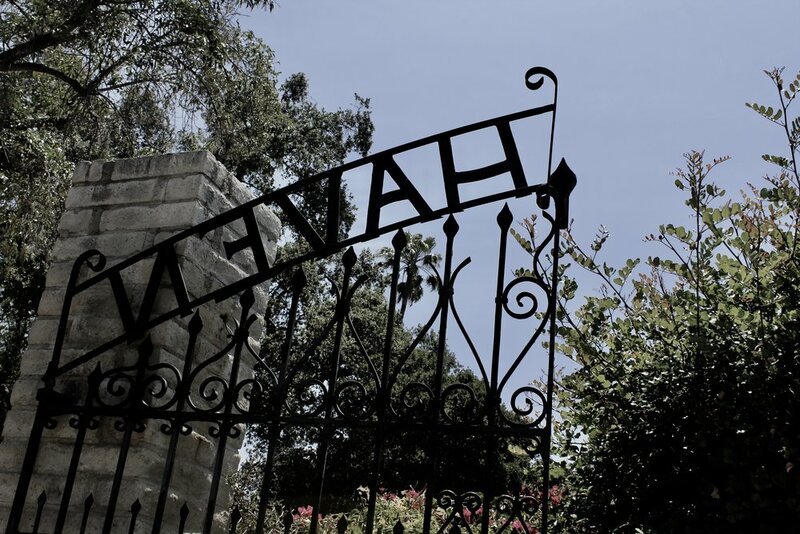 There is peace in Rockhaven, and you can feel it as soon as you enter through the rusted, intricate gates. The place is saturated in an unexpected, daydream silence– a few curious visitors walking amongst the sunshine paths, easels propped against walls, people painting the gentle silence of this scenery onto canvas. The rooms tell stories of women and their lives, through old photographs, rosaries, a scarf or ribbon here and there. There are some women in a small office in the front of the building. 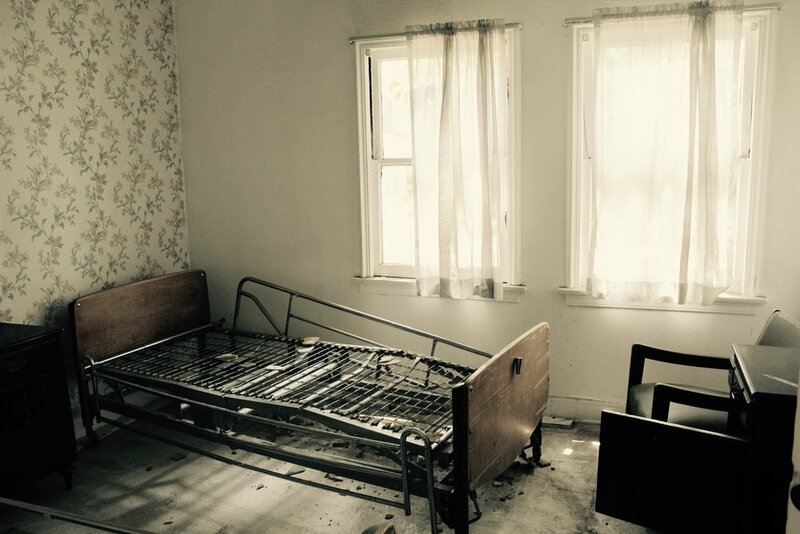 They run the sanitarium now– it’s a historical site, but a hidden and under-acknowledged one. The vast legacy of this place– its importance, its history– goes mostly unknown. Rockhaven was a small revolution of its own, a defiant sanctuary. Women and the psychiatric field have always had a difficult relationship. For years, uniquely female conditions were classified as mental disorders worthy of being institutionalized: menopause, being a lesbian, “hysteria,” and even, as Sezin Koehler puts it in her piece about Rockhaven, “deviating from traditional norms of femininity.” So Agnes Richards founded Rockhaven Sanitarium as an alternative to the ubiquitous, inhumane horrors and injustices of most sanitariums or “mental asylums” in the country. At Rockhaven, women were treated as people, kindly and compassionately, utilizing contemporary, gentler means of therapy. Women were not denied autonomy. To proceed with particularly strong treatments such as electroshock therapy, consent was mandatory– which was not a norm at other institutions. The sheer tranquility of the environment that they lived in at Rockhaven acted almost as a form of treatment itself. Rockhaven is not well-known, and its preservation has constantly been compromised by developers wishing to build everything from condominiums to a mini-mall. The Friends of Rockhaven manage the site and are doing everything in their power to fight for its preservation, but, this severe lack of awareness is no small coincidence. Crucial pieces of feminist history are often considered irrelevant, taboo, and unworthy of recognition. Rockhaven did not perfect mental health treatment, but it did aid in revolutionizing the industry, and the way in which female patients are treated: as human beings. France is warm honeysuckle streets, the bitter breath of the sea, fierce sweat on my eyebrows, the brazen scream of the sun on the tops of apartments and expensive boutiques. I know the South of France very well. I come here with my mother, with my family, and the quaint, quiet lyric of the region has become familiar. The colors of the French Riviera are muted peach and strawberry satin. At lunchtime, the drowsy clink of wine glasses sweating cold rosé, sharp-nosed laughter, French I can't understand and scrupulous looks at my messy clothes I can. I do not fit in, not in the midst of simplicity, elegance, pastel minimalist dreamlight and freshly prepared seafood. I wear tired black overalls and a red tee shirt. I am not a local, that much is painfully clear. My camera, inconspicuous as I may try to make it, draws a subtle distaste, not unpolite, exactly, but something I too can understand. In my city, afternoons on Abbot Kinney elicit those strained lips and narrowed eyes from me, too- fanny packs, an assaulting herd of I Love LA tee-shirts, selfie-sticks that remind me more of jousting matches, in their abundance. I hold that same impersonal contempt for those unacquainted with what I know so terribly well. It's stupid, I know it is. But nonetheless, it is not uncommon. Then there are cold-tile, shiny mornings soaked in the warming, idle pleasure of being utterly alone with nothing to do and a city barely awake, gentle and cool at this time of day. I take the elevator down and I smile at the concierge. I walk. I tie my hair back, blink a bit, and slow my pace. There are cafes already steaming fresh cafe au laits, preparing for the day, chairs and tables carefully placed on the crowded sidewalks. The farmer's market, the vendors relaxed in their efforts. There are boys, sometimes, who glance at me with smart half-smirks and twinkling eyes, and I flush ferociously despite my most ardent intentions to remain unaffected by the male gaze. They are pretty, and French, with messy hair and sleepy hellos. They are not hurling intimidation and employing their maleness to whistle and scream me into quiet, trembling tears, the way it is in America. It is not perfect here, but I notice these little things. I buy fresh coffee and six hot chocolate croissants. Here, cuddled into the corner of this open shop, I smell comfort. I smell bread baking and eggs crackling on the stove and coffee-stained fingertips. There is a peace in all of this that is so oddly hard to recover once I'm back home. The sea is another world. It shudders and sleeps, wails and murmurs. It is unignorable but it is subtle, patient. I study the rushing blue, crassly beating the sand down and down. Then it all changes. The gentleness of the water returns, and I could bathe in it, I sink into the waves and think nothing. My sister and I play for hours, dipping each other under the warm foaming ocean, laughter bubbling in our stomachs and our cheeks, tiny silver slivers of fish grazing our ankles. We race one another to the rocks. I feel her small fingers plunge into my arm and I see her mouth opening to let out a brilliant, brutal screech. She has stepped on a sea urchin, in all its pokey, painful beauty, so I carry her out of the water and onto the beach. We are doused in sand and rock. She cries and cries. It is a lot, but the lifeguard rushes straight to us, tends to her swelling foot, reassures us in a language I cannot translate but I understand anyways. France in the summer glistens with seawater and exhaustion. I love it. It takes me away from the gruesome mundaneness of my own everyday. It delivers independence. It delivers absentmindedness. I am all too present in this head of mine every other moment. I hate the beach, the heat, the eye contact here, but there, it is calming. I exit my mind and float about sleepily and contentedly. A series of photographs I took on a trip to San Francisco last year, 2016.